My favorite grassfed butter, the very best butter I have found. Henri Charpentier was once the most famous chef in America. He was born in France and became an orphan at an early age. He grew up in poverty, became an apprentice in a restaurant, and literally cooked his way into becoming one of the most famous chefs in France. Charpentier moved to the United States and started a small restaurant in a rural area, which was patronized by some of the most wealthy, famous, and powerful Americans of the day, who would travel for many hours just to enjoy the wonderful food he cooked. He published the Henri Charpentier Cookbook in 1945. In the book, Charpentier shared his most important cooking secret. The secret was very simple. He advised his readers to buy the very best butter they could afford. He did use a great deal of high-quality butter in his cooking and in his cookbook. When I first read this simple advice, I laughed at it. It seemed like a joke. Everybody knew that butter was butter, and all butter was the same. I was very mistaken, but I knew no better. Americans had been told for many years that our modern American food was all very good, and all pretty much the same. Trying to find and buy an especially good type of butter seemed both foolish and extravagant. I have learned a lot over many years of cooking. One of the most important things I have learned is that some varieties of a particular food are of a much better quality than others. 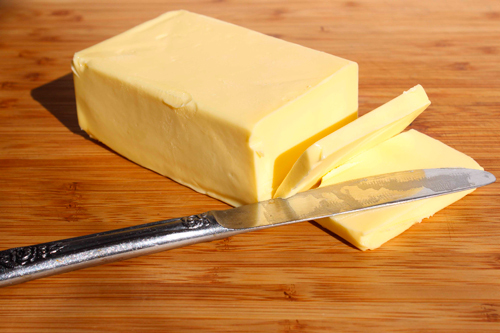 Using the best butter I can find in my cooking has made an enormous difference, both in taste and in nutrition. And this distinction applies not only to butter, but to every kind of food. Our ancestors were obsessed with quality and were always trying to find the best quality food they could afford, and spent a lot of time and effort in doing so. Some years ago, I used small amounts of a relatively expensive olive oil to marinate meats and achieved excellent results. Over the years, I started using less expensive olive oils, which were also organic and traditionally made. Yesterday, I found myself thinking about the wonderful olive oil I used to use and bought some. I used a little bit as part of a marinade for some grassfed lamb. The meat came out so tender, with an intensity of flavor that was far beyond what I expected. The good oil had somehow brought out and intensified all the flavors in the dish, making it much better than it had been when I used the less expensive oil. I now realize that Henri Charpentier was right. The quality of the ingredients is the most important part of cooking a great meal. The oil I used was certainly not the most expensive olive oil out there, but it was so much better than the others I had used. It changed the quality of the dish from good to excellent, and was worth the extra expense and effort. Price is not the only indicator of quality. Something is not necessarily better just because it costs more. You will only know the quality of the food when you taste it and digest it. I am convinced that there is a huge difference in quality in the foods that we can get, and it matters very much. Our ancestors knew that, and as with so many other things about food, they were right. Bone marrow, the soft white substance inside bones, has been one of the most prized and valued traditional foods, not only for humans, but for animal predators. Lions and other predators use their powerful jaws to crack open the bones of their prey, to get at the bone marrow. Most ancient cave dwelling sites have a pile of old bones, which have been split open to get at the bone marrow. Most cultures have traditional recipes for bone marrow, often adding cut bones to broth. Modern research has shown that bone marrow contains many substances and nutrients that are very valuable, and can rebuild and revitalize various areas of the body, such as the bones and the blood. Many of us who seek to follow the nutritional wisdom of our ancestors make bone broth, very often with marrow bones included. The bones are usually cut, so the marrow is exposed. I have made numerous bone broths, often with marrow bones. While all the broths felt good and revitalizing to me, I did not notice any real difference in broths that contained marrow bones, and broths that did not. Until I changed the way I made it. I have made bone marrow broth the new way exactly once, but the results have been amazing. I feel a great burst of energy and renewal as I drink it, a much stronger reaction than I usually get from drinking homemade broth. The taste is also different, more intense, and quite pleasant. I used to make bone marrow broth by putting the cut bones in a pot, often with other bones and meat, and simmering it for a very long time, with added salt. But I have noticed that most of the marrow seems to stay within the bone itself, though in a cooked form. Wild animals and the cave people were the inspiration for the change I made. They removed the marrow from the bones. What if I did the same? So, using a small spoon, I carefully removed most of the marrow from the marrow bones, and placed it in the stock pot. Since the bones I purchase are already cut, this was not that hard, though I took some time, being careful not to break off tiny pieces of bone. The marrow resembled tubes of a soft white substance, which floated on the water once I added it to the broth. I cooked the broth in the usual way, and all the marrow dissolved into the broth. As always, I carefully strained the broth through a fine sieve before consumption or storage to ensure that no little bone bits are in the strained broth. The broth did taste different, more intense, but not unpleasant. But I did not mind the new taste, because the broth felt better, and was the most energizing and best feeling thing I have ever drunk. I now understand why our ancestors prized the bone marrow so much, and I happily look forward to drinking it, every day. And I crave the wonderful new taste of the dissolved bone marrow, because my body has learned to love it! A rich traditional stew is good eating, loaded with nutrition. Most traditional stews throughout the world have one thing in common. They were cooked until most of the vegetables were very soft, often disintegrating into the stew. The meat was also cooked right along with the vegetables, until it was very soft, and easy to chew. However, in more modern stews, the vegetables are usually cooked separately, so they remain in distinct pieces, and the vegetables are added to the meat only a few minutes before serving. This is considered to look better, and to preserve more of the nutrients in the vegetables. But our ancestors cooked everything together, and were fine with the vegetables disintegrating into the stew. I made a couple of traditional stews this winter, and really enjoyed them on the cold, rainy days we have been having. They tasted wonderful, and warmed and renewed me, in a way that no modern stew ever did. I felt better while I ate them, and after I ate them. After some thought, I realized that the traditional stew, with its long-cooked ingredients melting into each other, is much easier to eat, and to digest. Since it is easier to eat and digest, that means that the nutrients in the stew are more easily absorbed and processed by our bodies. The long, slow cooking breaks down the components of the vegetables and meat, making them softer, often causing some of the vegetables to disintegrate into the gravy, with their precious nutrients. 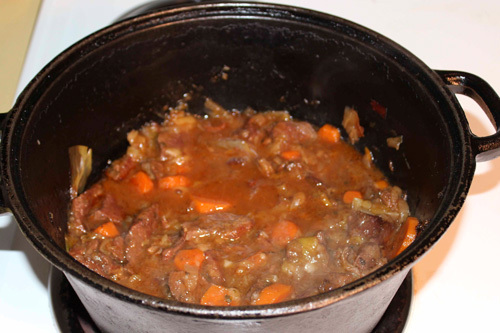 When the stew is eaten, the nutrients are right in the gravy, all broken down into a much more easily absorbed form. It is true that cooking may reduce the amount of vitamin content in some vegetables, but vegetables are hard to digest and many people have trouble absorbing the nutrients. Cooking them in a traditional stew makes the remaining nutrients very easy to absorb, so you end up getting more nutrition. This idea is supported by the tradition, in many lands, and throughout Europe, of feeding stews and broths to people who were recovering from sickness or physical injury. These kinds of foods were considered vital for recovery, because our ancestors knew, through knowledge passed down for thousands of years, that stews and broths helped people recover. I usually add cabbage and onions to my stews, and they almost totally disintegrate into the stew by the time the cooking is over. The flavor they add is beyond wonderful. The other vegetables are very soft, partially disintegrated into the stew, and taste so good, flavored by all the ingredients. I am sticking to traditional stews, every time. Traditional Gouda cheese is a good source of Vitamin K.
I have often been puzzled by the popularity of various protein bars. Usually they contain one the cheapest, most processed, and least desirable of proteins—soy protein. They also include a variety of nuts, various sweeteners, perhaps some dried fruit, a variety of chemicals, and are usually low-fat or no fat. There are some more natural varieties, but even these do not come close to the ultimate protein bar—a slice of traditional cheese. Traditional cheese, made from good, truly natural milk, with all of its natural fat, is fermented, which creates additional nutrients. Dry cheeses can be carried around in a wrapping, providing wonderful nutrition when opened and eaten. Such cheeses are rich in easily digestible protein, and have the natural fat that should always be eaten with protein. In addition to this, these cheeses are rich in many minerals such as calcium, and have a rich vitamin content, some varieties being especially rich in Vitamin K, a nutrient that is hard to get in our modern world. 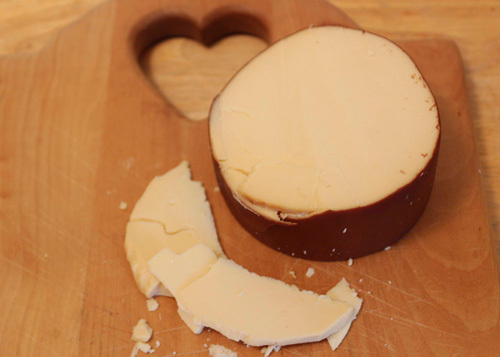 Traditional cheese is often extremely tasty and satisfying, while providing a full range of vital nutrients. There are a huge variety of these traditional cheeses, so it is impossible to be bored, and some are so good that it is impossible for me to tire of their taste. Many armies, from the ancient Greeks and Romans, up to the French Foreign Legion in the early twentieth century, would provide hard, dry traditional cheeses to their soldiers as part of their field rations. Shepherds and travelers in ancient, medieval, and even early modern times would often carry cheese with them so they would have something really good to eat while watching the sheep, or on their journey. Using cheese as a protein bar is a very old tradition. If I am going somewhere and need instant nutrition available, I always pack some hard, dry cheese, never a protein bar. This post is part of Fat Tuesday and Real Food Wednesday blog carnivals. I have spent a lot of time reading old descriptions of traditional food. Some of these recipes are so different from how we cook today that they may never be made again. Yet we can learn from them. The ingredients could not be simpler. A single young lamb, gutted, with the head, wool, hooves, everything, left on. Some large rocks that would not crack from heat were heated in a hot fire. That is, the rocks were placed in the fire, and kept there until they were literally red hot, glowing with their own heat. Then the rocks were removed from the fire with tongs, and placed in the cavity of the gutted lamb. The cavity was sewn closed with sturdy twine, and the cooks and guests waited for it to be done. First, the wool would burn off. I think the smell of burning wool might have been very bad. When all the wool had burned off, from the interior heat, the skin would start to crisp. At some point after this, the lamb would be considered ready. The meat was so tender that the diners would serve themselves by literally pulling the lamb apart with their hands, and grabbing the pieces they wanted. The Chinese food writers wrote that this lamb was one of the most delicious things you could possibly eat. I would never try this myself. Heating rocks until they are red hot could be very dangerous, leading to serious injury or worse, or fires if something goes wrong. Even heating the wrong rock could result in an explosion that would send red hot pieces of rock flying in all directions. The Mongol cooks were experts in using this method. I believe those skills have long been lost. Why Was It So Good? At the time of the writing, Chinese food was heavily seasoned and spiced, meat was eaten in small quantities, and was often cut into small pieces and stir-fried, lamb was almost never eaten, and the center of most meals was the featured grain, either rice or wheat. The prevailing attitude in China was that only Chinese cooking was worth eating, and all other cuisines were inferior. In other words, “Grab Your Own Lamb” was as un-Chinese a dish as you could possibly find. So why did the Chinese writers love it so much? I think it was the bones and the fat, cooked right into the meat. I am just guessing here, but it is based on my experience in cooking much smaller pieces of meat on the bone, with the fat. Cooking the lamb whole, with all its bones and fat, meant that substances from the bones and fat would cook right into the meat, helping it become more tender, adding incredible flavor, and greatly increasing the nutritional value of the meat. This provided so much flavor that no spices were needed. 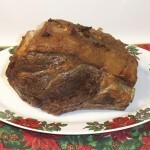 I recently made a small roast from a very fatty piece of grassfed meat, which I was able to get with all the fat left on. I barbecued it with no seasoning other than the smoke of the fire. Unbelievably tender and delicious, and we felt so good after eating it. I have had even better results when I could get the fat and the bone. 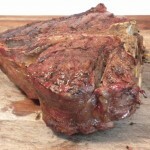 Cooking meat on the bone, with the fat, provides incredible flavor, tenderness, and nutrition. This post is part of Fat Tuesday blog carnival. When a holiday approached, our ancestors, all over the world, anticipated the feast with great joy, happiness, and anticipation. The feast would be prepared by skilled cooks, from the best traditional foods available, and would provide a happy time where everyone would enjoy the fun, happiness, satisfaction and joy of sharing a special great meal. Yet in modern America, the approach of the holiday feasts is cluttered with a blizzard of cautionary articles, posts, and warnings that could ruin the joy of any meal. Avoid fat, avoid eating too much, avoid gaining weight, avoid eggs in the stuffing, avoid the skin on the turkey, avoid cooking the stuffing in the bird, avoid calories, avoid, avoid AVOID! In other words, avoid the traditional joy of the feast and worry about what you eat, even on the holidays. Most of the people who have lived on this earth would be puzzled by this kill-joy attitude. I advocate enjoying the holiday feasts, and the traditional dishes that have been used to celebrate them. Most of the fear of the feast is based on fear of fat. This fear is based on the debunked belief that animal fat is always bad for us. This is just not true, as documented in the book The Big Fat Surprise: Why Butter & Cheese Belong in a Healthy Diet, and many other credible sources, including articles in the New York Times and Time magazine. I have seen ads for Thanksgiving which featured mounds of different kinds of steamed vegetables. I have seen vegetarian “roasts” made mostly of soy, in the shape of a turkey. I have read articles advocating roasting a turkey breast instead of a turkey, with the skin to be trimmed off and discarded before serving. None of these things are traditional, and none of them are for me. And we will most definitely eat every last bit of the crisp, buttery, wonderful turkey skin. Now, that is a feast to look forward to! Disclaimer: Information found on the Tender Grassfed Meat site, including this article, is meant for educational and informational purposes only. Any statements or claims about the possible health benefits conferred by any foods or anything else have not been evaluated by the Food & Drug Administration and are not intended to diagnose, treat, cure, or prevent any disease. None of the content on the Tender Grassfed Meat site should be relied upon for any purpose, and nothing here is a substitute for a medical diagnosis or medical treatment. This post is part o Fat Tuesday and Real Food Wednesday blog carnivals. Usually I write about meat. But today I am going to rise up in defense of one of our most important vegetables, the mighty onion. A recent article on the Internet claimed that onions should not be eaten, claiming that onions have little nutritional value. The overwhelming majority of our ancestors valued onions as one of their most important foods, using them for all kinds of culinary and healing purposes. I side with our ancestors on this one. The claim that onions are not nutritious is apparently based on the content of detectable vitamins and minerals. There are two problems with this claim. The first problem is that researchers are constantly discovering new nutrients and substances in plants. Many of the nutrients we recognize today were unknown twenty years ago, or even five years ago. The discovery process continues. Second, onions contain unique substances whose effect has not been fully researched. 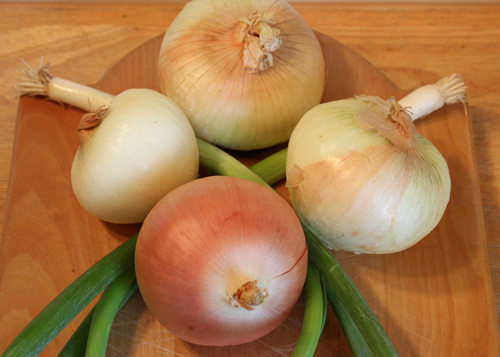 Some research has shown that onions have anti-bacterial and anti-inflammatory properties. These substances may have additional beneficial effects. Our ancestors certainly thought so. If you research the world’s cuisines, as I have done for many years, you will find that onions may be the most used and most popular vegetable in history. Onions were a vital part of the cooking of the ancient Egyptians, ancient Romans, ancient Greeks, ancient Chinese, ancient Celts, and just about every other significant ancient people we know of. Most of these peoples believed that onions were vital for their health and well being. Onions were used in marinades, stews, stir-fries, roasts, braises, and soups, and most meat dishes contained their share of onions. Every modern cuisine I have studied, from Europe to Asia, to Africa, to South America, the Caribbean, and just about everywhere else, makes extensive use of onions in their traditional cuisines. Onions are widely used in meat dishes, vegetable dishes, soups, broths, curries—wherever you have traditional cooking, onions appear. I have found onions, whether yellow, red, or green, to be invaluable for tenderizing and flavoring grassfed meat. Nearly all of my stews, pot roasts, meatloaves, stir-fries, and most of my roasts contain onions in one form or another. My favorite vegetable to eat with grassfed meat is onions fried in plenty of butter, which I love. I could go on and on about onions, but this will do for now. Our modern culture is very arrogant. We are taught that our culture is much more advanced, scientific, and knowledgeable in every area of life than our ancestors. This arrogance often leads to misinformation being taught as truth. We are told that our ancestors ate spoiled meat, and wanted spices to hide the foul taste. Not true. Our ancestors had many effective ways of preserving meat, which did not use toxic chemicals and preservatives, and which preserved the nutritional value of the food, and sometimes increased it. When I was in school, even college, we were taught that our ancestors ate spoiled meat, because they did not have refrigerators or freezers. Furthermore, we were told that our ancestors craved spices to hide the taste of spoiled meat. This is simply not true. While our ancestors might eat spoiled meat under extreme circumstances (such as being on a ship, far out to sea, when the salted meat started to spoil), this was very unusual. You also cannot hide the taste of truly spoiled meat with spices, though many spices can help preserve meat, and keep insects away. Often, several of these methods were used to preserve a particular piece of meat. Hams, for instance, were often salted, smoked, and dried. Bacon was salted and smoked. Sausages were often smoked, salted, and fermented. There were many other methods used as well. The ancient Romans and Greeks often preserved meat and fish by submerging them in olive oil. Meat was often preserved by cooking it in a large amount of fat, than covering it with fat and sealing it in a container. 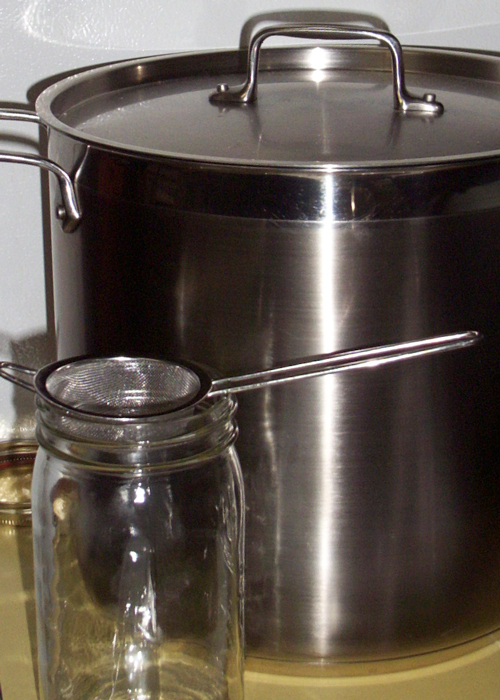 Traditional French confit uses this method. In cold climates, ice was cut into blocks and placed in cellars or caves to preserve meat. In some cold areas, meat was wrapped in hides and placed in the very cold soil, which would completely freeze during the winter. The meat was dug up and eaten when the soil had thawed. Another method was to dry meat in the sun, then pound it into a paste with fat and some kind of fruit. The famous Pemmican of the Native Americans was preserved in this manner. These methods required skill and knowledge to be done effectively. They did not keep the food preserved indefinitely, but they did preserve the food for a while. And many would consider them to be preferable to modern methods, such as chemical preservatives and irradiation. Our ancestors did not eat spoiled meat. They knew how to preserve it. This post is part of Fat Tuesday, Real Food Wednesday and Fight Back Friday blog carnivals. 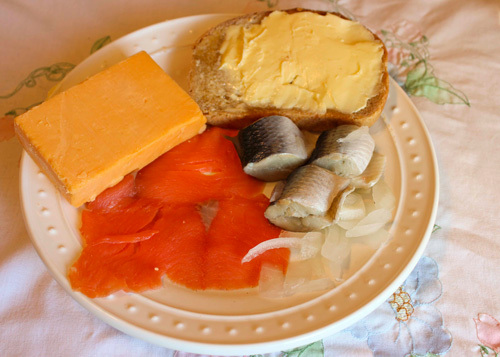 My dad’s traditional breakfast included full-fat cheddar cheese, rye bread with lots of butter, marinated herring and onions, and smoked salmon. I had four relatives in my family who lived long lives: my mother, my aunt, my uncle, and my dad. Three of them had severe Alzheimer’s during the last years. But my dad, who lived to be ninety, (he should have lived longer, but that is another story) was sharp as a tack, right up to his last day. He had no signs of mental impairment. I have often wondered why he was different. The other three took the advice of their doctors, and put themselves on low-fat diets. But my dad continued to eat a special breakfast that had been taught to him, which was full of animal fat. I think he kept sharp because of the special breakfast he always had, and the way he kept his mind active. I do not know if what he did will help others, but I have decided to share it. I asked my dad why he ate it, especially when my mother was so mean to him over it. He said that his father told him that it would keep his mind sharp. Interestingly enough, the butter, cheese, and egg yolks contributed valuable animal fat and other nutrients that are very important for nourishing the brain. Some studies have shown that eating eggs every day may be an important factor in maintaining mental function. Both herring and salmon are very fatty fish. He ate them raw, though one had been fermented by smoking, and the other by marinating. Fermenting foods preserve and increase their nutrient value. Fish has been recommended for mental sharpness for thousands of years. The ancient Egyptians believed that onions would heal and prevent all kinds of problems. Again, the onions were raw, somewhat fermented from the marinade. My dad never wrote down phone numbers. He always memorized them, keeping them in his head. And he always remembered them when he needed to make a call. He could hold hundreds in his mind at a time, and was always able to recall them. My dad always followed the news of the world, keeping himself current on every issue. He would watch or read about the news many hours a day. And he would think about the issues, analyze them, and come up with ways to solve them that I thought were much more sensible than what the politicians actually did. I asked him once why he spent so much time on the news, and why he memorized the phone numbers instead of writing them down. He said that he liked to use his mind. Some studies have shown that older people who are mentally active are far less likely to get Alzheimer’s. Now, this is what he did, on advice from his father, who was also mentally sharp until the day he died. I do not know if this will work for anyone else. But I am so grateful that he kept a sharp mind throughout his entire life. In our heavily medicated culture, we have been conditioned to believe that the way to get well is to have a doctor diagnose our illness, and prescribe a drug for it. We then expect to take the drug, and get well. In many cases, we do not get well. The symptoms are relieved, and we get some immediate relief, but the underlying cause of the illness is not touched. Many people who try to use food first for healing treat it like taking a drug. For example, people with a sore throat will take a honey vinegar drink, expecting it to act like a drug and provide immediate relief. Sometime it will, sometimes it will not. Sometimes the underlying condition will disappear. And sometimes it will not. This is because the food we eat does not act like drugs. No food acts directly to cure an illness. Instead, the food provides various substances to our bodies. It is the natural functions of our bodies that use these substances to actually heal us. So, if eating a particular real food does not help, it is likely that something else the body needs is missing. Eating a diversified, wide ranging diet of real foods is our best chance of giving our bodies what they need to stay healthy. And, if we avoid chemicals that deceive our senses, like the flavor chemicals put in processed foods, our bodies may actually tell us what foods we need. Some of these ingredients are produced by our bodies. But other ingredients can only be obtained from food. Our bodies also need the right substances from food to make the ingredients our bodies produce. The key is to eat the foods that our bodies need for our natural functions to work well. So How Do We Know What Foods to Eat? Our ancestral food traditions give us a lot of information. These traditions emphasize a huge variety of real foods, prepared and combined in many different ways. But the best guide we have is the craving for a particular food. Our bodies know what foods we need to eat, and make us hungry for them. Our ancestors could trust these cravings. But most modern people cannot. Factory food and chemicals deceive our natural sense of what is needed. We cannot trust these cravings, if we eat processed food, or food with chemicals. That is because these foods have chemicals added to them that fool our bodies into believing that the food contains something it does not. Flavor enhancers do this, and chemicals that make people crave a certain factory food do this. Large amounts of refined sugar do this, as do chemical additives. It is like trying to see a path when you have been given hallucinogenic drugs. The only way to get our cravings back on track is to eat only real food, with no added chemicals. Once we do this, our bodies can recover their natural abilities to know what to eat. Some years ago, the skin on my fingertips was drying, peeling, and splitting. I ate a good diet, and I tried various natural remedies, but nothing helped. I did avoid all processed foods and foods with added chemicals .One day, I visited a wonderful organic farm, where the soil had never been sprayed with chemicals. Some apricots were for sale at that farm, and I felt an intense craving for them. I should mention that I never liked apricots. But I went with the feeling, and bought a large amount of these apricots. Once we got home, I began eating them in large quantities. They were delicious, and I loved eating them. They were gone in a few days, and so was my skin problem. It never returned. Now, that was not just the apricots, but many of the other real foods I was eating at the time, combining to give the natural functions of my body the ingredients they needed to repair my body. But the apricots did provide the missing ingredient, whatever it was. Now, I am not saying to stop using modern medicine. It can be very helpful, even lifesaving, especially in cases of trauma. But I am saying that I have found that supporting the natural functions of my body with real food, avoiding all factory food, and listening to what my body wants has been very effective in keeping me healthy, and in healing conditions that the doctors could not help me with.